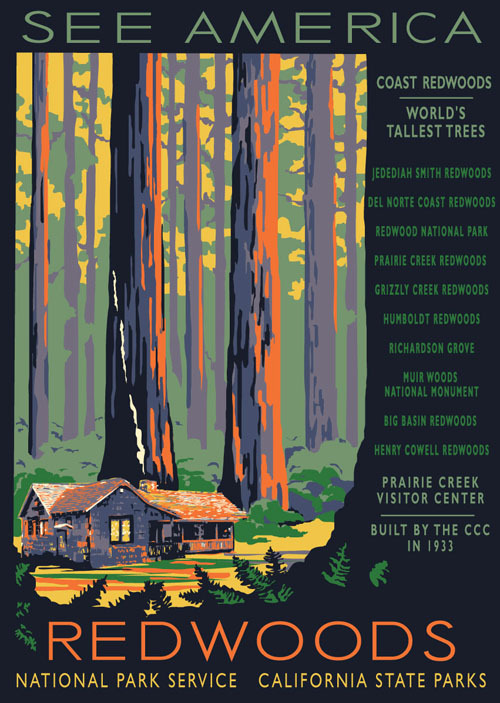 Our Redwoods image will be available mid-August. Here is a sneak preview. I chose the Prairie Creek Visitor Center as the focus, with a "window" style design, and using the See America theme. There are over 100 groves and this park(s) is managed both by the NPS and California State Parks. I think this is a good compromise listing the top ten groves. The PCVC was built by the CCC in 1933 and opened in 1934. We're the only ones making silk screened prints and only charging $40! Enjoy.